Yep… that was my exact response when my partner Cecilia suggested we headed up to a town two hours north of Granada to meet her friends who were over from America for the weekend. We left work at around 3pm on Friday and jumped in the car to start our four hour journey to reach our hotel, El Geco Verde. Taking the toil roads past Malaga, things didn’t start to get interesting until we got off the highway and onto the country roads. As darkness set in, driving on these under lit roads became increasingly challenging as the terrain around us changed. While I was loving life and pretending to be a rally driver (much to Cecilia’s dismay) I was forced to be extra vigilant as two wild boars ran out onto the road. We continued twisting and turning, going through a town called Pozo Alcón twice! before we finally arrived on the hotels driveway. Needless to say, this was much more challenging in the dark. We arrived just before 8pm and we were greeted at the door by the Italian owner Ilaria, who gave us a guided tour of the hotel and then showed us to our room. After freshening up, we headed down for dinner where we were served a three course meal of courgette soup, Italian inspired meatloaf with apple and a side of mash and a dessert of homemade pancakes. Washing this down with a couple of glasses of the local wine and feeling content, we headed up to our room and called it a night. Waking up Saturday morning we were able to take in the view for the first time and we were not disappointed! We strolled into the breakfast room and met up with Molly, Eric and their son Henry. Cecilia and Molly used to ride Horses together in American and as Molly and her family were coming to Spain for a vacation, it was great to be able to meet up with them. Breakfast was served by Des, IIaria’s husband. This consisted of toast with apricot or strawberry preserve or a choice of cereals and yogurt. As Des is a fellow Englishman, tea as well as coffee was also offered. After asking Des where we should hike today, he suggested that we drive down to the town of Castril and hike from one end of the town to the other. We set off by car to Castril which was about a 12km (9 mile) drive. The town of Castril is located at the foot of a steep cliff and borders the Natural Park of Cazorla, Segura and Las Villas . Castril and its surrounding Valleys are characterized for its spectacular views and abundance of streams and caves. As you can see from the image above, the landscape is truely breath taking. Before climbing closer to the river for better views of the waterfall. Molly, Eric and Henry by the waterfall. 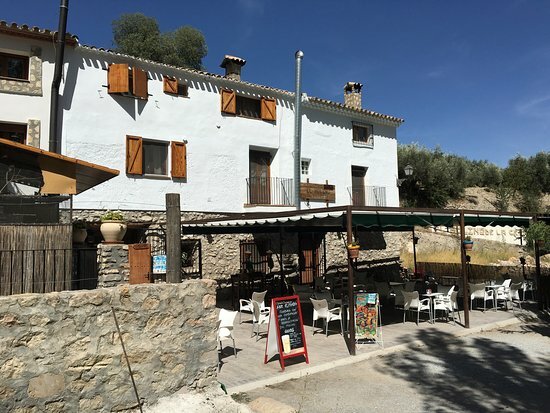 After all this exploring we stopped for a bite to eat in the sun at El Molino de La Cerrada. Eric had been craving some quality Spanish Jamon y queso since he’d landed so we ordered a few sandwiches and a plate of fried Calamares. Yum Yum! Feeling reenergised, we strolled back into town, passing wild olive and pomegranate trees on the way. By this time it was around 2pm and the whole town was shutting down for siesta time! Molly, Eric and Henry headed back to the hotel for some bike riding while Cecilia and I jumped in the car and headed to the Parque Natural Sierra de Castril for more hiking! As we entered the national park, we realised that we had to drive 10km down to the start of the trail on what can only be described as a “sketchy road”. Not only did I have to concentrate on not driving over the side of the cliff into the valley below but halfway down we were met by a farmer and around 200 sheep! I’d like to say this was the end of our animal adventures, however about 1km later we were met by about 50 goats! We arrived at the start of the trail and as you can imagine the scenery was spectacular! As we reached the summit we were expecting to see a waterfall, sadly this had dried up due to a hot summer and little rainfall, however the beauty of the national park can still be appreciated. We headed back to the hotel as dusk was setting in, Stopping only to take one last photo. The view of the Valley from the edge of the national park. Back at the hotel, we had a quick siesta before meeting Molly and co for dinner. Stay tuned to find out what we got up to at dinner and on Sunday in part 2.